Destin is an amazing getaway spot bursting with beautiful scenery and exciting attractions. For many visitors, one of the highlights is being able to spot dolphins in the wild. Seeing dolphins in their natural habitat is remarkably different from seeing them in an aquarium. Let this serve as your guide to learning more about the dolphins swimming around Destin and how you can get a glimpse of these wonderful mammals. 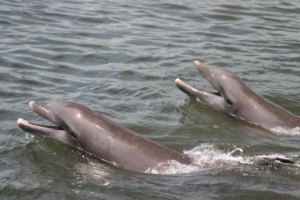 There are many different types of dolphins that live in the Gulf of Mexico. 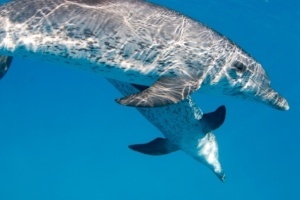 The Atlantic spotted dolphin, for instance, can occasionally be seen off the coast of Destin and all the way to the Indian Ocean. 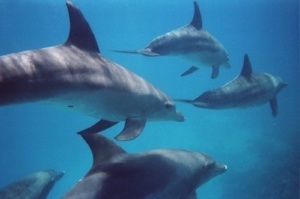 However, the most commonly spotted dolphin in Destin is the bottlenose dolphin, or Tursiops truncatus. The bottlenose dolphin is sometimes referred to as a porpoise. While they share certain characteristics, they are completely different species. A bottlenose dolphin will typically be a blue-gray color, and have lightly-colored bellies. On average, an adult bottlenose dolphin can be anywhere from six to twelve feet in length. In many destinations, it is not possible to spot dolphins year-round. In Destin, dolphins don't migrate much, if at all, which means that they can be found right off the coast from January through to December. It’s common for dolphin watching tours in the Destin area to offer fewer trips during the winter months due to reduced number of visitors to the area. Be sure to check on availability if you are visiting in the low season. Many people find that early morning is a great time to spot dolphins. In the Destin area, dolphins tend to be active in the morning and mid-afternoon when the waters tend to be calmer and there is less boat traffic. It is possible to see dolphins from a number of spots in Destin. Many visitors choose to stay on the high floors of beachfront hotels, because with a pair of binoculars dolphins can be spotted from the balconies. Walking on the sand of Henderson Beach State Park or Elgin Beach Park, it may be possible to spot dolphins from a distance. For the best chance at seeing dolphins up close, it helps to be on the water. Guided boat tours take passengers to well-known dolphin sighting spots, but having a private boat charter such as a pontoon gives you a little more freedom. Boats can stay within Choctawhatchee Bay, and dolphins are often seen swimming underneath the Destin Bridge. Occasionally, dolphins are spotted right in the waters of the Destin Harbor. Some people think that you need to keep your pontoon boat at the slowest possible speed in order to see dolphins, but dolphins actually like the wake! When safe—and legal— to do so, picking up the speed a little might make them easier to spot. Keep in mind that in shallower areas, dolphins tend to be in groups of four to seven. So, if you see one dolphin, keep your eyes peeled for a few more in the area. Swimming with dolphins should never be attempted in the wild. Not only is it illegal to harass (or feed and pet too!) wild dolphins, it can be dangerous for even strong swimmers. It’s best to appreciate their beauty from the safety of a boat. A great way to try and catch a glimpse of dolphins is from the upper deck of a double-decker pontoon boat. Double Fun Watersports offers half- and full-day charters of their new double-decker pontoon boats. Whether you're eager to spot dolphins in Destin, cruise the Choctawhatchee Bay, or party at Crab Island, Double Fun Watersports offers the right pontoon boat charters for an incredible trip.